Folds look really good, Pard. Jason, Thanks. 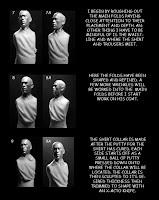 I would go more in depth for this project but it's not a SCULPT 101 type of thing. I'm also trying to be mindful of how many images I can post before going into paying for space. I probably can post quite a bit before needing to worry, but that's me. Looking good so far. Those folds look nice. Is this Sculpey? Matt, Thanks. Actually it's Aves Apoxie Sculpt. It's great to work with and carves great.